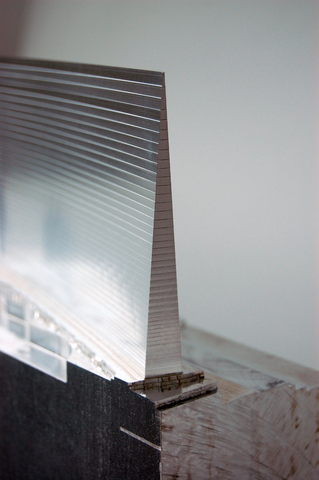 'DPA' is a digitally designed and manufactured artifact resulting from a research project to establish the technical and mechanical limitations of machine and material within a highly controlled Computer Numeric machining process. The author has developed am indepth and personal knowledge of CNC milling software and hardware over a period of twenty years. This intimate understanding of the relationship between code and form has enabled Masterton to challenge established conventions and boundaries enabling the development of innovative and unique metalwork. each layer shimmering, light dancing in all directions; a liquid surface, flowing. that nick and chatter, gouge and tear. separates the billet from its parent. As a child growing up in Scotland I spent many weekends walking the highlands with my mum and dad, often we would happen upon plane wreckage, torn pieces of aluminium fuselage strewn amongst the heather. I collected these oxidised and distorted forms, fascinated by their technological achievements and failure. DPA or Destructive Physical Anaylsis is an acronym used to describe the process of testing a design or component until it fails. This form of testing provides the manufacturer with useful information about how, why and when a part may fail enabling them to improve or refine the design. Destructive testing is used for objects of mass production as destroying one-offs is not economical. Complex measuring devices such as strain gauges and high speed cameras are used to document the failure point. For the piece ‘DPA’ I wanted to push the material, machine and cutting tools to their limits, possibly even past their failure point, the aim was not to achieve a beautifully finished and controlled piece of work but rather to work right on the edge of all their limits. Early test pieces enabled me to establish what these limits might be and how I could work with them to achieve a unique and technically challenging one off piece. The form is drawn from my interests in aerospace and is influenced by the complex CNC milling of individual turbine blades used in jet engines; widely regarded as one of the most technically challenging manufacturing processes. However my blade is more interested in utilising the cutting tools specific mark potential as part of the aesthetic language than trying to achieve a uniform surface finish. The piece challenged me from the outset as the starting billet of metal was larger than anything I have ever cut at 800mm long and a total of 39KG in weight. I want the piece to reveal every step of the process in achieving the thin blade like form, to show the different forming processes that this material had taken through its life, hence none of the marks or edges have been cleaned or polished. 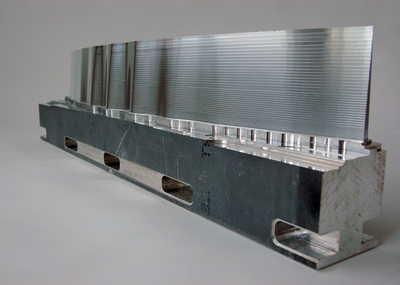 One of the first challenges was designing a clamping method in order to hold the metal on the bed of the milling machine. The horizontal deep pockets along the lower edge of the piece are the spaces for 10 clamps to stop the piece from vibrating. The use of a ruby crystal touch probe enabled me to accurately measure the exact centre of the metal and align the work to my digital cutting space. Specialist cutting tools were purchased from Mitsubishi Carbide with extremely long cutting reach and internal cooling channels to minimise thermal expansion of the cutting tips during long cutting cycles. I had to rely on audio feedback from the cutting in order to constantly tune the cutting speeds due to the constant need for liquid coolant which obscured any view of the metal. Total cutting time for the piece was over 90 Hours. 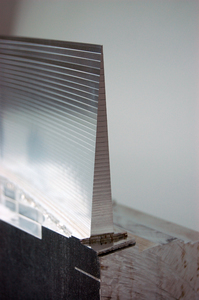 The final cutting of the blade surface removed 0.2mm of material at a cutting speed of less than 200mm per min due to the high vibration generated in both the long cutting tool and the extremely thin cross section of the surface (0.4mm thick).